Security at the Palace of Westminster has been gradually tightened during the 35 years I have worked there. It was not enough, however, to stop yesterday's horrific incident taking place just below our third-floor office in the parliamentary press gallery. The dilemma for the security forces and the parliamentary authorities is acute: how to provide safety for MPs, staff and visitors without infringing the historic right of the public to turn up, present a "green card" and try to meet their constituency MP in the ornate central lobby. Over the years, the steel barriers have gone up, the entrances have been fortified, the number of armed police increased and airport-style searches and scanners introduced for visitors. But it was an open secret that the need to preserve public access meant that security in the palace could not be as strong as it would be for another public building. Many politicians believed an attack was only a matter of time in an age when "cleanskin" home-grown terrorists can be inspired to act alone on the internet without training or indoctrination. The symbol of democracy around the world was always a likely target. Indeed, it has been targeted before. 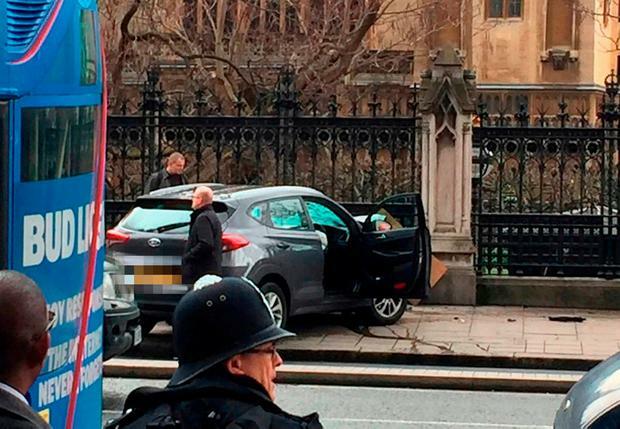 Only a hundred yards from where yesterday's incident happened in New Palace Yard, Airey Neave, the Conservative spokesman on Northern Ireland and close ally of Margaret Thatcher, was killed by a car bomb as he drove out of the MPs' car park in 1979. The Irish National Liberation Army claimed responsibility. In 1991, a few hundred yards away in Whitehall, the IRA set off a mortar bomb which landed in the garden of Downing Street, next to the cabinet room where then prime minister John Major was meeting ministers. Other parliaments have also been targeted. In 2014, a suspected jihadist gunman shot dead a soldier at the national war memorial in Ottawa and rampaged through the halls of the Canadian federal parliament. In 2006, loyalist murderer Michael Stone stormed the entrance hall of the parliament building in Belfast armed with a handgun, knife and what police described as a "viable" bomb, forcing the suspension of the first meeting of Northern Ireland's transitional assembly. Whatever the inquest into yesterday's attack at Westminster finds, things will never be the same again - not least on physical security. Yet the dilemma will remain the same. If parliament becomes an exclusion zone, as some security experts will no doubt advise, then some MPs will rightly feel that they are "giving in" to the terrorists, as well as infringing the rights of their constituents. Of course there will have to be a full-scale review of security. Perhaps mistakes have been made. Lessons can always be learned. But turning the mother of parliaments into a fortress would make our politicians even more remote from the people they serve, in an era when they need to move closer to them.